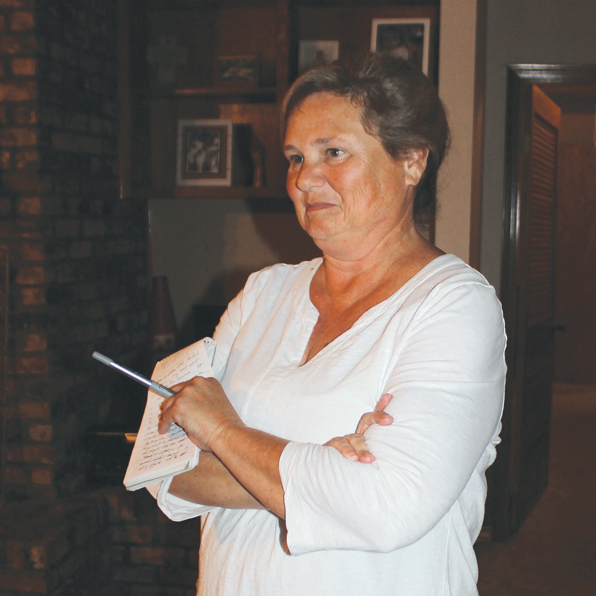 CENTRAL — When Jay Dantin died unexpectedly of an aortic aneurism six years ago, it seemed like the end of the world for his wife Robin and their six children. Jay graduated from Catholic High. He worked hard, and five of the six children were enrolled in Catholic schools — at Catholic High, St. Joseph’s Academy, and St. Alphonsus. The sixth child, Tori, is a special needs child who is mentally disabled. Robin and the children missed their father deeply and learned all too well what an important role he played in the family. As the insurance money ran out, the financial pressure grew greater and greater. But it’s not just about money. Jay is no longer around to be a dad by helping with the children, sharing the responsibilities, and maintaining the property. Sometimes Robin wakes up in the middle of the night in a cold sweat engulfed by a sense of panic, not knowing how the family can survive another day. Every penny is used for housing, utilities, food, tuition, and medical bills. Since they moved into another house two years ago, there has been no money to buy furniture for the living room or beds for Robin or Diana. They’ve been sleeping on the floor. When something is broken that requires an electrician, a plumber or a carpenter, it goes unrepaired. There is no money to pay someone $150 to come out and repair it. Washing for so many kids is practically a full-time job, and the family gets behind on washing clothes and cleaning the house. Hauling kids to school and extracurricular events is another full-time job. The special needs daughter Tori has had many problems this year. She is sweet and cooperative 90 percent of the time, but more and more often she has become hostile and sometimes quite violent. It takes everything to pay for the necessities, and there is no money to buy a Christmas tree or fix the broken glass pane in the front door. No money to fix the garbage disposal or the hot water heater. The hot water heater. In fact, when the hot water heater went out last week, Robin began boiling water for the kitchen and the kids’ baths. Things were going from bad to worse. “When you have worked hard, and you are used to being independent and paying your way, it’s very hard to let anyone know the struggles you’re going through,” Robin said. And she didn’t let anyone know. Then one day last week, she asked a friend if she knew anyone who could fix a hot water heater. The friend — call her Angel No. 1 — said yes, her husband — call him Angel No. 2 — could do the job. If not, her brother in law — call him Angel No. 3 — could do it. Robin agreed to let them come over and look at the hot water heater. That was Friday morning. Robin and her kids were driving to her nephew’s wedding in Florida. They wouldn’t return until Sunday night. The night before they left, the Dantin kids were out in the front yard, trying to string some Christmas lights. The lights didn’t work. Disappointed, they gave up. When Angel No. 2 arrived to work on the hot water heater, he was appalled at what he saw. “The house needed a good cleaning, and nothing worked! They didn’t have some of the essential furniture that people have, and there was nothing on the walls,” he said. More Angels started arriving — the son of Angel Nos. 3 and 4 — call him Angel No. 5 — and other friends. Angel Nos. 1-5 refused to tell the other Angels whose house they were in, just that the family needed help. Some Central merchants chipped in, without even knowing who they were helping. First, the Angels cleaned the entire house from top to bottom. Every floor and every wall. They fixed the hot water heater, the garbage disposal, and the front door. They repaired the ceiling fan in the living room, so that it worked, and put in two other ceiling fans in the house. They replaced dozens of missing light bulbs. Suddenly, there was light and a clean house! The new Angels who arrived had ideas for improving the Dantin’s house too. Soon someone had donated a beautiful couch for the living room and a coffee table. Someone else found a nice painting for the living room wall. The Angels came across Dantin family photos, but nothing was framed. So they chose the ones they liked the best and hung them on the wall! They got a new bed, a dresser, and decorations. Soon it was a perfect teenage girl’s room! The Angels went into Robin’s room. Again, there was only a mattress on the floor. No bed, no dresser. So they went to work, located a nice bed, a dresser, and a lamp table. Everything looked great. The kitchen was a wreck, but the Angels went to work, cleaning and improving. They cooked food for the week, wrapped it, and put it in the refrigerator. After all the work was done, they brought in beautiful decorations and inspirational quotes. They washed the dirty clothes. Things were looking 100 percent — no 200 percent — better. But something was missing. Then the Angels realized the family didn’t have a Christmas tree. So they found a beautiful tree and decorated it. Finally, the Angels said, “This family needs Christmas lights in the front yard!” So they proceeded to decorate the yard. As the car pulled into the driveway, the kids burst out of the car! They were laughing and shouting, in total disbelief of what they were seeing. “We have Christmas lights!” they said. Then when they walked in the front door, they were even more amazed, and they ran and jumped around the house! “We have a couch!” the little one, Tyler, 9, shouted. “And a ceiling fan!” One of the kids took a short video of the kids laughing and jumping. Diana, 13, loved her new room. Robin loved her new room too and the kitchen! So different! Daughter Dené, who is 24 and a teacher, no longer lives at home, but she was on the trip to Florida with the family. She had a lot to say about what the Angels did for her mother and the entire family. A total of 12 Angels helped the Dantin Family have a better Christmas this year — a Christmas they will never forget! Some notes on the Dantin Family. The late Jay Dantin graduated from Catholic High. He died six years ago when he was 46. Robin Dantin graduated from Central High School. Their first date was to a Catholic High football game. “We used to argue over who was the real ‘CHS’” she laughed. Dené, 24, is now a teacher in the East Baton Rouge Parish school system. Todd, now 19, is a student at Northwestern in Natchitoches. Dillon, 17, attended St. Alphonsus and is now at Central High. Diana, 13, and Tyler, 9, both attend St. Alphonsus. Daughter Tori, now 21, attended Central High until last year in the special education department. She is now living in a group home in Zachary. Tori’s photo has appeared several times in the Central City News. Before leaving Central High, she was chosen to be an honorary Cheerleader with the Central Wildcat Cheerleaders. Robin has a strong commitment to Catholic education and has made great sacrifices to keep most of the children in Catholic schools. Until now, she felt she shouldn’t work outside the home. “I’ve never wanted the children to come home without my being there. Raising six children is itself a full-time job. Throw in a job, and it is impossible.” But now, with only three children at home, Robin feels it’s time to get a job, and she is in the job market. She can be reached at 225-270-7779.